Properties in Mezzocorona Borgata Station average 4.6 out of 5 stars. 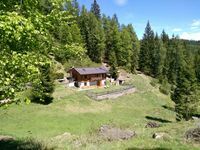 Property 22: Ancient and renovated nice mountain hut, detached. We absolutely loved this home. The home was so warm and cozy but large at the same time. The home was nicely stocked and all of the furnishings were very comfortable. There was so much to see in the surrounding areas. If you enjoy nature versus shopping I highly recommend visiting this area rather than Lake Como. We only had 2 nights here and I wish we would have had more time. The owners were so nice and helpful and they had a fire and apple strudel for us upon arrival. We will definitely make this a destination when we return to Italy. We had a warm welcome with good explanation of the Baita. We love to hike, perfect area even immediately from the house. We love to cook and the options we had to prepare our meals were numerous! Indoor wood stove (besides the regular gas stove) outdoor wood stove. After cooking outside we made a fire in the fire pit, plenty of wood all ready to use. If you don't like to hike just relaxing in the garden is amazing.